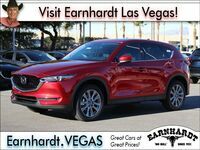 A popular entry in the compact crossover segment that boasts class-above luxury, innovative technology, an athletic style and power-packed thrills under the hood, the 2019 Mazda CX-5 is a fan favorite at Earnhardt Mazda Las Vegas. Drivers who have fallen in love with the Mazda CX-5 will have their pick of five premium grades – Sport, Touring, Grand Touring, Grand Touring Reserve and Signature – that can be tailored to fit your lifestyle. Take a closer look at popular Mazda CX-5 trims with this 2019 Mazda CX-5 Touring vs 2019 Mazda CX-5 Grand Touring comparison. Are you looking for a compact crossover that will add a little pizzazz to your next family road trip? The 2019 Mazda CX-5 will check all the boxes. Mazda CX-5 entries make room for five passengers in a luxurious cabin that adds 30.9 cubic feet of cargo space behind the rear seats. When the 40/20/40 split-folding rear seats are laid flat, the Mazda CX-5 provides families with 59.6 cubic feet of available cargo space that is perfect for larger cargo. Families who are looking for a Mazda CX-5 that will fit their budget and lifestyle will find what they are looking for in this 2019 Mazda CX-5 Touring vs 2019 Mazda CX-5 Grand Touring trim level comparison. With a more affordable price tag that starts at $26,615 and an impressive list of standard features, the Mazda CX-5 Touring promises exceptional value. Mazda CX-5 Grand Touring entries will add more luxury, more technology and more options for a price that starts at $30,045. Mazda CX-5 Touring – Powered by a standard 187-horsepower 2.5-liter SKYACTIV®-G four-cylinder engine that pairs with a six-speed SKYACTIV®-Drive automatic transmission, the Mazda CX-5 Touring will achieve 31 mpg on the highway. Mazda i-ACTIV AWD® is available to upgrade performance when faced with inclement weather. Elements that come standard in the Mazda CX-5 Touring trim include 17-inch alloy wheels, dual-zone automatic climate control, leatherette-trimmed seats with Lux Suede® inserts, heated front seats, i-ACTIVSENSE® safety features and a 7-inch MAZDA CONNECT™ touchscreen infotainment system with Apple CarPlay and Android Auto. A Touring Preferred Package is available that will add a power sunroof, a power liftgate, an auto-dimming rearview mirror and a 10-speaker Bose® premium sound system. Mazda CX-5 Grand Touring – With the Mazda CX-5 Touring as a foundation, the Grand Touring trim is even more impressive when you slide into the driver’s seat. The 2.5-liter SKYACTIV®-G four-cylinder engine remains as the standard powertrain and delivers the high-end performance that you expect from the Mazda CX-5. To upgrade your drive, the Mazda CX-5 Grand Touring will add 19-inch alloy wheels, an Adaptive Front-Lighting System, LED headlights, LED foglights, LED Daytime Running Lights, LED taillights, heated side mirrors, a leather interior, power front seats, a power sunroof, heated front seats, a 7-inch Multi-Information Display, integrated navigation capabilities and more. The available GT Premium Package will add an Active Driving Display, ventilated front seats, heated rear seats, a heated steering wheel, a windshield wiper de-icer feature and power-folding side mirrors. 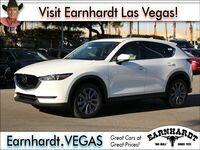 Visit Earnhardt Mazda Las Vegas today to get behind the wheel of a 2019 Mazda CX-5!